On April 15, 1912, the most famous ocean liner in the word sank at the will of an iceberg and the arrogance of shipbuilders. Many Canadian ports were involved in the rescue and recovery operation. Halifax had the sad task of being a victim identification centre and explains why three Halifax cemeteries hold graves from this tragedy. 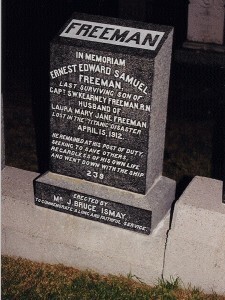 Although I did not take a picture of it, I did see the J. Dawson headstone and wondered if James Cameron used it as inspiration for the fictional Jack Dawson. According to a bit of web surfing, it seems this is a coincidence. If you remember the story of the movie, Jack Dawson won his ticket for the voyage in a card game and his name would never have been on the passenger manifest. 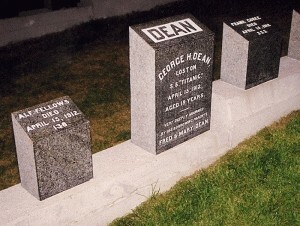 I do recall an eerie feeling looking at the gravestones (my own pictures are attached) because when a story like the Titanic has been told and retold so many times, it becomes less real. One look at these gravestones changes your mind.